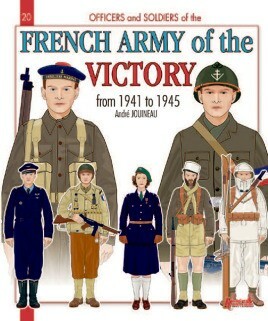 After the defeat in 1940, the Vichy Government started reforming the army which the occupier had been good enough to let it keep. At the same time in England, General de Gaulle got down to setting up a unit for all the volunteers drifting in from all over the Empire. Soon, after Operation Torch, the Americans started supplying the French Army in North Africa with equipment, materiel and clothing. This army of victory distinguished itself in Italy, in France and on the other side of Rhine during the last three years of the war. Discover the twentieth volume in the collection, the multifarious blend of uniforms which was such a feature of the French Liberation Army.